The ever-solid and charming Fred “the Hammer” Williamson stars as a rugged itinerant gunslinger who becomes the reluctant constant patsy for slick’n’shrewd con man Richard Pryor. The crafty duo experience a series of goofy misadventures in the Old West in this amiably inane and inconsequential piece of low-budget blaxploitation sagebrush fluff. Competently directed by Williamson (who also wrote the slight, but witty script), the rambling narrative saunters along at a pleasingly relaxed rate, the tone remains pleasant and playful throughout, and there’s a winningly breezy’n’easy chemistry between the two leads, with Williamson engagingly playing the long-suffering straight man to Pryor’s smartaleck joker. 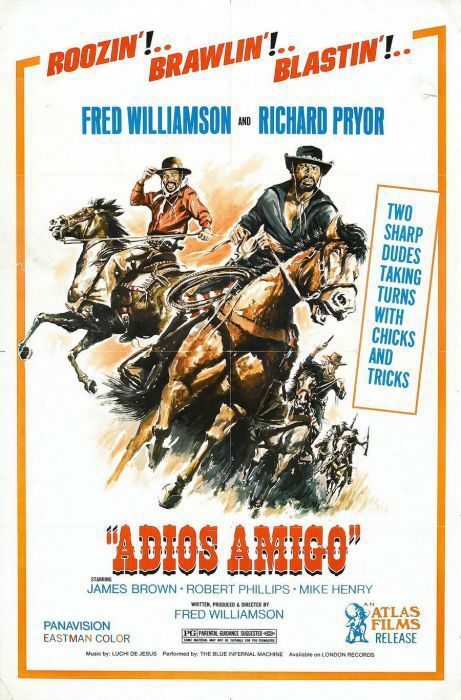 Moreover, Williamson stages the expected rough’n’tumble fisticuffs, heated shoot-outs, a daring jailbreak and frantic horseback chase sequences with a reasonable amount of skill and brio. Popping up in nifty supporting parts are Thalmus (“Blacula,” “Cool Breeze”) Rasulala as a rascally old coot with two hot daughters and former Tarzan Mike Henry as a dumb, ornery cuss. Both Luchi (“Friday Foster”) De Jesus’ cool soulful score and especially the funky R&B theme song really hit the groovy spot. Granted, “Blazing Saddles” this picture sure ain’t, but it’s a satisfyingly lightweight and good-natured diversion just the same.